The (*1)history of South Leigh is intertwined with the history of Stanton Harcourt. It was not until the 1630s that South Leigh had status as an independent manor, 1773 before the boundaries between the two were clarified and 1868 that the chapelry of South Leigh became a separate parish. The first vicar of South Leigh, Gerard Moultrie, was appointed in 1868. South Leigh is not named in the Domesday Book, being part of Stanton Harcourt held by Otto, Bishop of Bayeaux. The Stanton Harcourt woodland mentioned in the Domesday Book was probably Tar Wood. (Tar = tor =hill) In 1190 South Leigh was recorded as a forest clearing from Stanton Harcourt , with its own chapel. By 1279 about 40 households were noted and, other than a serious decline caused by the Black Death, the number of households remained at about 40 at the time of the first census in 1801. The 1851 peak of 359 people was soon depleted by emigration (particularly to (*2)New Zealand) in the period of agricultural depression in the 1860s and 1870s. The 1850s population level was not reached again until the 1980s by which time South Leigh was a dormitory village for commuters to Witney and Oxford. South Leigh is 4 km south east of Witney and 13 km west of Oxford and bounded by Stanton Harcourt on the south east and Cogges on the west. Until 1974, the (*3)boundary with the County of Berkshire ran on the southern edge of Stanton Harcourt. The Witney to Oxford road cuts across the north west tip and the River Windrush and Standlake brook cross the southern boundary. On the western boundary runs a Roman or pre-historic trackway. Romano-British coffins were found in South Leigh near the River Windrush. The south east boundary with Stanton Harcourt was not fixed until the Enclosure Award of 1773. The manor of South Leigh had been bought in 1792 by John Sibthorpe, just in time to benefit from the Enclosure Award. (*4)He cut down some 3000 oak and other trees "for my repairs and my encloures" and employed 54 men as carpenters, masons, hedgers, ditchers, roadmen and woodmen. By the 1790s there were four or five farms. By 1848, there were six farms of 100 acres or more but by 1878 all but two of these farms were vacant because of the agricultural depression. A railway station opened in 1861 but closed to passengers in 1965 and to freight in 1971. A post office opened in 1870 and closed in 1987. A village school opened in 1871, following national initiatives under the 1870 Education Act, but closed in 1946. Whilst the church of St James the Great at South Leigh did not gain independence until 1868, it has a much longer history, having been built by 1176 and being able to conduct burials in its own cemetary. The font is 15th century and baptisms must have been conducted although recorded as in Stanton Harcourt. 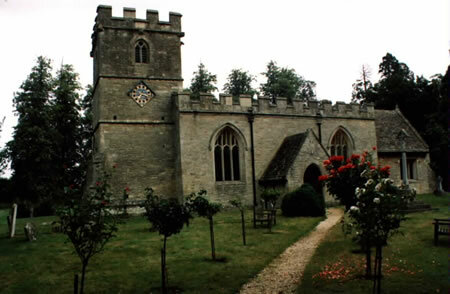 At times, the vicar of the mother church at Stanton Harcourt was required to maintain a curate at South Leigh; at others, the Stanton Harcourt vicar led services in both churches. 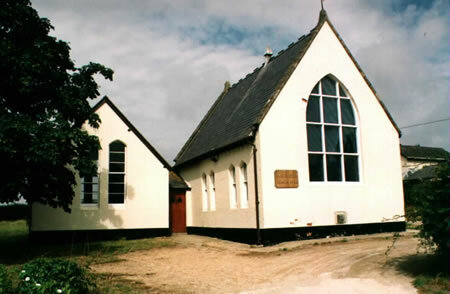 The first vicar of South Leigh had a vicarage built, helped to set up the village school, established a choir, founded St James' College (an independent school designed to enable the St James' choirboys to improve their literacy), organised a clothing club and a lending library and increased the number of weekly services from one to 14. On arrival he found the church in a ruinous state and saw to its restoration. It was during these restorations that the 15th century wall paintings were discovered. Ironically, having served as a chapelry of Stanton Harcourt for so many centuries and becoming a separate parish with its own vicar only in 1868, St James the Great, South Leigh has had no resident vicar since 1970 and is now served from Cogges. It remains, however, a separate parish. (*3) The Brogden descendants who can be found to this day in Cumnor are in fact living very close to South Leigh, as, of course, are those in Witney.